Being that my bedroom is my room for everything, tranquillity is key. Scents play a huge part in that too, anything that helps to calm my anxiety is needed, that's why I always feel I need a diffuser and/or candles. I keep diffusers on my chest of drawers next to my bed, having the smell nearer to me helps me during the night to have something calming. 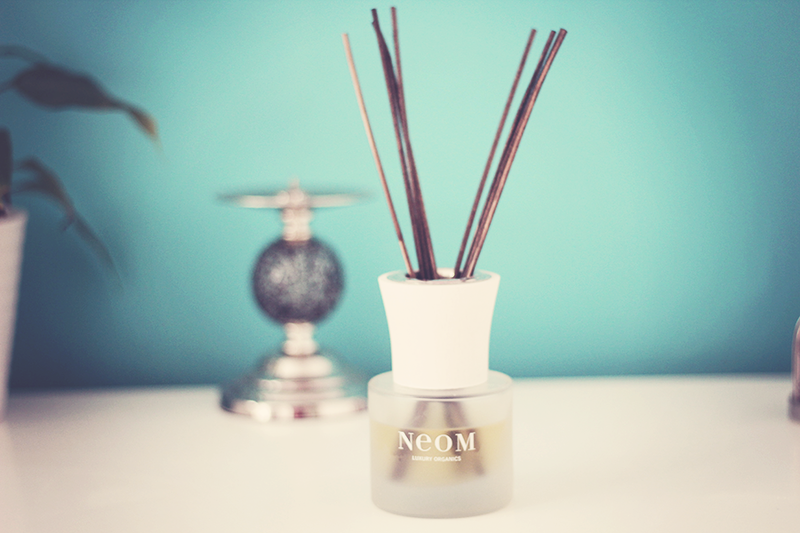 After reviewing the NEOM Contentment candle last month I chose to go ahead and review a reed diffuser from them, choosing the Invigorate Organic Reed Diffuser. I adore citrus scents it's calming as opposed to Lavender which doesn't calm me, has this opposite affect on me and makes me nauseas so being around familiar, likeable scents make me happy. An uplifting and zesty scent that promotes positive thoughts and a strengthened spirit. Bergamot's antiseptic and healing properties, blended with mood-boosting Grapefruit, makes for an altogether more confident you. Organic Alcohol, Fractionated Coconut Oil, Fragrance Blend (Pure Essential Oils of Grapefruit, Bergamot & Lime). Bergamot oil is sometimes inhaled (used as aromatherapy) to reduce anxiety during radiation treatment. It comes in a glass bottle with a stopper but there's something about the frosty glass of the bottle that I love the most, the whole essence of the sticks, the wooden sticks gives it that natural feel. As if I made it myself. It says to give it 48 hours to allow the fragrance to diffuse but by the next morning, when I left my room and returned, I could smell it, less than 24 hours later. Roughly every 4 days I invert the sticks to get the best results. The scent has been complimented by visitors ( not sure how I should take that, never got no compliments before ) & I too think I made a wise pick. I'm so happy that I got a few tweets in regards to my other NEOM post and had influenced a few of you to try the brand, I do hope you ladies have been happy with your purchases. They are definitely a luxury as the tag line of their brand says 'Luxury Organics' the price may be steep for what you see but these are luxuries and to me, I will purchase once it's finished for health reasons. The smell really does help me, might be a mind over matter but if it works, who cares! 80% Certified Organic Ingredients // 20% Natural Ingredients // 100% Pure Essential Oils. No Petrochemicals, SLS, Parabens, PEGs, Silicone or Animal Products. So now tell me, how do you feel about diffusers? Love 'em, hate 'em? I've always wanted to try NEOM diffusers but the price always put me off. I think I may start small and if I feel that they work, then i'll shell out on the luxury! This diffuser looks gorgeous though!